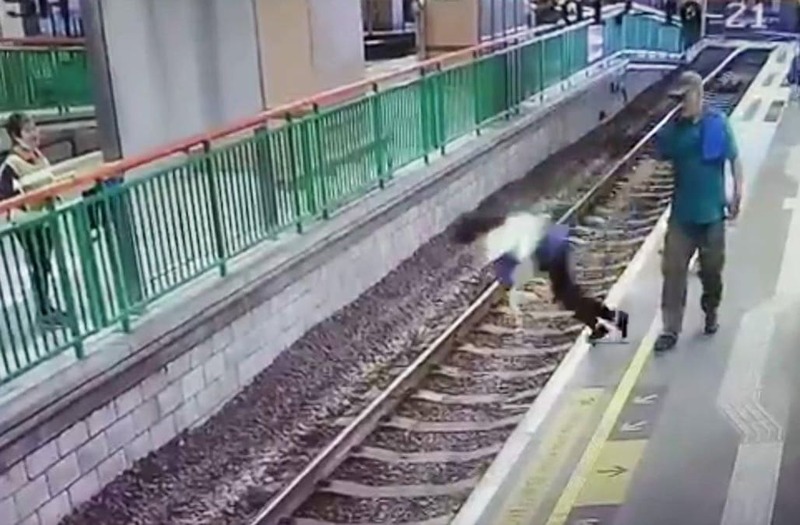 A man was caught on video shoving a woman off a train platform onto railroad tracks in Hong Kong Saturday morning. The terrifying CCTV footage shows a man wearing a blue shirt and a beige hat walking behind a cleaner as she stopped to wave at a colleague across the tracks. Suddenly, out of the blue, the man pushed her over the edge at the Yuen Long station, according to the South China Morning Post. The 56-year-old man then casually walks away as several people looked on, video shows. No trains passed by as the 59-year-old woman was on the tracks. Police officers arrested the man — whose identity hasn’t been released — near the train station on suspicion of assault, according to the Post. The paper reported that the man of Southeast Asian origin has a Hong Kong identity card. The woman suffered injuries to her jaw and was taken to a hospital, police said. Cops are investigating a motive for the incident.